Before there was HeLa, there was a woman. Her name was Henrietta Lacks. This could almost be a book review, but not quite, and it certainly took me far longer to write than originally planned. You know the deal; lab work, traveling, late-night RPG-sessions, all the stuff that makes time fly and where you suddenly realize there was a draft lying there somewhere that needs working on. Well, here goes! As I’m aspiring to become a *proper* scientist, I toil away for hours every week in the cell culture lab. I shouldn’t use a word with such negative connotations as toil, though – afterall, I’m usually having lots of fun while doing my experiments. In our incubators, stand large cell culture bottles labeled with names such Sudhl-6, Ramos, Raji, Ros-50 – and so it goes, oh – and; HeLa. What’s this HeLa? you may ask; a familiar name to most people with some biological or medical training, but maybe not to you. The scientific landscape as we know it today would probably have looked quite different hadn’t it been for cell lines; cells from a single source, often a tumour from man or beast. Due to random or deliberate mutations and/or other treatment these cells have been allowed to escape the limited number of cell divisions normal tissue is restricted by, commonly known as the Hayflick limit. Simply put, it means that these cells are immortal, and can be grown for ever and ever. Taken into consideration that cells can be stored almost eternally on liquid nitrogen, you have an almost bottomless reservoir of little guys who are ready to take everything you throw at them in the name of science. There are many cell lines out there, but work on HeLa alone has helped developing vaccines against for instance polio, much work on HIV treatment, it has aided the development of in vitro fertilization and much more. HeLa is used in my lab as well, although not widely, as we mostly work on lymphoma cell lines better fit for our needs. The number of scientific publications released annually which involves work on cell lines is sky-high. In 2011, the number of scientific publications using or referencing HeLa alone counted 4586, according to PubMed. However, it hasn’t always been like this. It’s the mid-1900s, scientists are working fervently to grow a human, immortal cell line without much success. 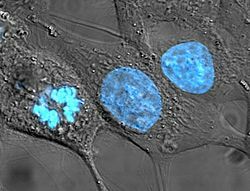 It seems like human cells, no matter how proliferative they might seem at first, just won’t grow outside their bodies. 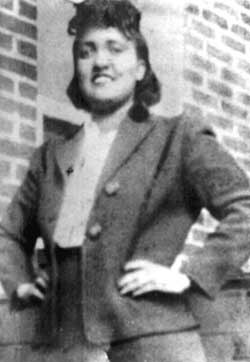 Things seemed dark, until one day, when a 31 year old Afro-American woman named Henrietta Lacks walked into Johns Hopkins hospital in Baltimore. For a while, she had been aware of a knot in her abdomen, and as it turned out, she had a particularly aggressive form of cervical cancer.She died a few months later after radiation therapy had failed. Autopsy revealed the cancer had metastatized to many tissues throughout her entire body. Left behind was her husband, Day, and their four children. However, one other thing remained; a sample from her cervix was harvested – without her and her family’s knowledge and consent – and they were proliferating rapidly in the lab of dr. George Gey. Her cells seemed to grow almost anywhere under any condition, and soon, they became quite popular with Gey’s scientific colleagues and acquaintances. Little was known about this one woman who – I don’t think it’s an exaggregation to say that – changed cell culture-based science as we know i,t and while her cells became a money-mill, her family was too poor to afford health insurance. Then a young biologist- turned-writer came along. Rebecca Skloot had been deeply fascinated by the HeLa-cells and their clouded history from the time when she was in high-school, and finally grasped the chance to create this little pearl of a book. It isn’t quite a biography, although much of Henrietta’s, and her family’s, lives are documented with much detail where Skloot paints a vivid image of the segregated America. It’s just as much a documentary about her own journey, the Lackses struggle for knowledge and recognition and a work on scientific history and ethics. First, I am quite impressed by the amount of work Skloot has put into her work. The sheer amount of time, travel distance and number of doors-in-the-face she has met and traversed is huge, and it took nearly a decade from her first phone-call to Henrietta’s daughter, Deborah, until the book hit the shelves in 2010. Skloot weaves a fascinating story as the book interchanges between recreated biographical scenes from Henrietta’s life and the research labs where the novelty and potential of her tumour were slowly unraveled, to diary extracts to documentary-style chapters where Rebecca herself becomes the main character. The Immortal Life of Henrietta Lacks is thus structurally complex, but well-handled. This is a story about race, health, class, science, education and human beings, and, inevitably, the ethics behind tissue ownership and tissue-derived patenting become important themes visited and revisited throughout the book. Considering what a minefield that particular subject can be, this is where I feared the book would fail. I was pleasantly surprised. Rebecca Skloot objectively maneuvers the minefield and pragmatically, but not without empathy, describes the situation from both a potential tissue-donor’s and a scientist’s point of view, and underlines how modern medical research is totally dependent on willing donors (my own lab is a good example in this respect; a vast majority of our work is done fully or partly on human blood and tonsils) as she simultaneously problematizes how, her examples are all taken from the United States, patients had little or no right to know about and approve of the usage of their tissue in research. Skloot never concludes this or that, but draws rather from her general understanding of the human nature and leaves the readers free to draw conclusions of their own. The last question is? Is this a book for science-people only? The answer is no, no and once again; no. 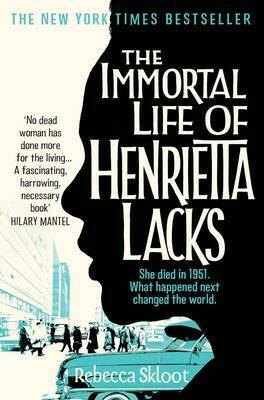 If you are averse to any scientific terminology whatsoever, then I believe you wouldn’t pick up The Immortal Life of Henrietta Lacks in the first place, but if you think this might be a story worth reading, but are daunted by the fact that off-handed science-y comments like “RPMI 1640 is inadequate if you want to study intracellular signaling pathways” you can relax. Science is the backbone of this story, but then again, presented in a way any scientific lay-man with a decent amount of common knowledge should easily grasp. Surely, having some kind of relevant background leaves you with a deeper understanding- more eastereggs if you like – but it’s certainly not required. And if that isn’t enough – appendices galore! If you venture around teh interwebs, you’ll find that much and more has been written about Henrietta, HeLa and this book – you’ll surely find loads of better, more thorough and wholesome entries on the subject; mine is simply a minor attempt to write a post I really think should be here. And here is my message: The Immortal Life of Henrietta Lacks is a well-written and enrapturing read about a woman who changed the world. It’s a gripping story about human beings and of science as we know it coming into being. If that sounds even vaguely interesting, I suggest you’d give it a go! On a side note: As I was looking up some extra information while writing this entry, I stumbled across several different sources stating that HBO would be making The Immortal Life of Henrietta Lacks into a movie produced by Oprah Winfrey and Alan Ball. Sadly, I haven’t found any more recent information about this, but according to Rebecca Skloot’s Twitter account, something seems to be under way. If this is correct, I’m already getting excited!